We didn’t have a reservation but after inquiring in 3 different car rental companies we finally found our ride. We had arrived in Salta, Argentina the night before after an 18 hr bus ride into the country from Chile. If there was one thing I’d discovered so far, it was that the scenery in northern Chile and Argentina was breath taking and I wanted to see more. Being in Argentina I also wanted to try some of their famous wine. And so our plans came to together. 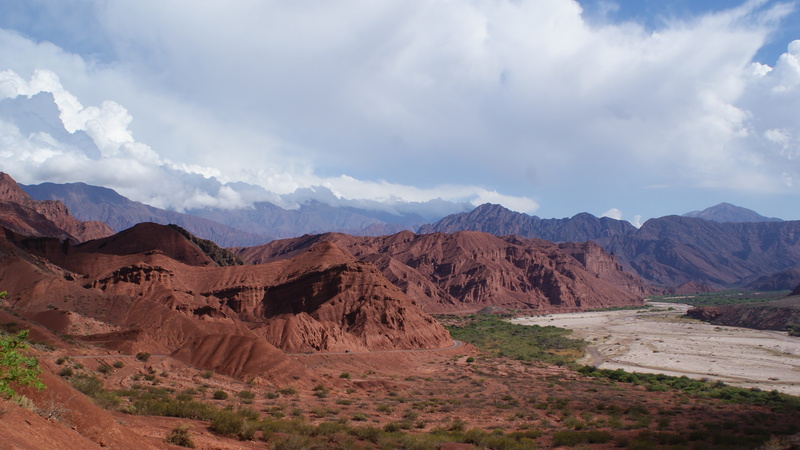 My friends and I decided to rent a car in Salta and do the scenic drive south to one of Argentina’s premier wine growing regions surrounding Cafayate in the Calchaquies Valley. Having had no car rental reservation, we almost had to scratch these plans. But after a bit of searching and some luck we were off, heading south on Route 68. Once we left the congested city limits the landscape opened up into farmland as we passed through small villages along the way. Soon the green farmland made the transition into red rock hills and cliffs, contrasted by vibrant green vegetation. 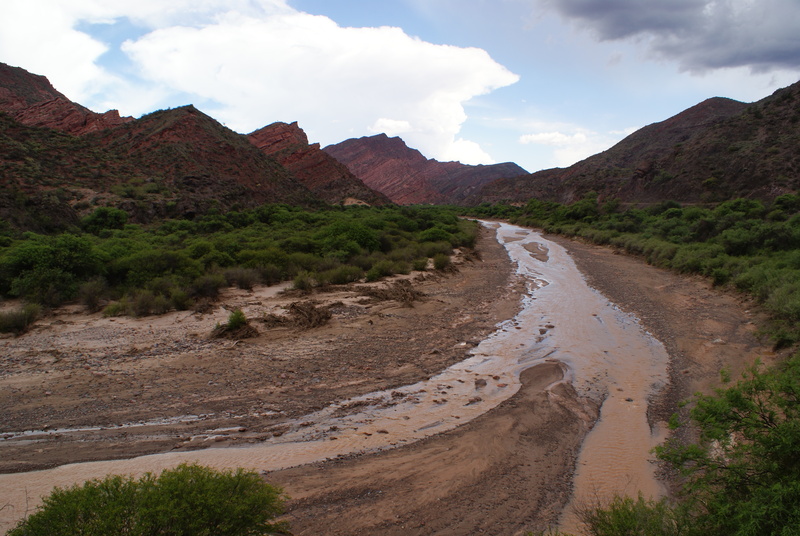 The road twisted and turned through the river valley as we followed various rivers and tributaries south towards Cafayate. Along the way we came across a few very impressive sandstone rock formations that also allowed us to take a break from the car to stretch our legs. Anyone driving Route 68 should make time to see these natural structures. The first one we came across was called the Devil’s Throat (Garganta del Diablo). This one consists of a huge slit in the side of a small sandstone mountain. The opening is narrow and the slit cuts deep into the mountain side. You can walk all the way into the back of the “throat” and admire the many layers upon layers of rock that have been compressed and twisted by nature over the years. Not too much farther down the road is an even larger rock formation called El Anfiteatro (The Amphitheater). This is a very large and impressive natural auditorium cut out of the sandstone rock. A group of teenagers where sitting off to one side playing guitar which aloud us to hear the impressive echo of music throughout the amphitheater. There are a few others along the way such as El Sapo (Toad), El Fraile (Friar), El Obelisco (Obelisk), and Los Castillos (Castles). Unfortunately we didn’t have the time to see all of these but the landscape was impressive none the less. Once we arrived in the little town of Cafayate, we checked into our hostel & bar, El Almacen, which to my delight, had a mini vineyard right in the backyard. What a great introduction into one of Argentina’s premier wine regions! After settling in, we wandered around the town square looking for a local wine bar to sample wine and have a snack. 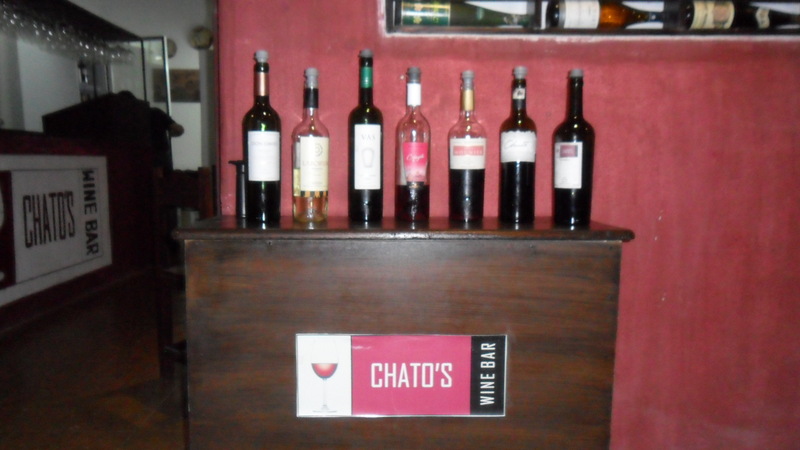 We easily found the perfect place called Chato’s Wine Bar, and met the owner and wine maker Oscar. We each ordered a sampler where we got to pick 5 different wines to taste while we enjoyed some charcuterie. Oscar brought over each bottle, one at a time, and patiently explained each wine as we sampled. This was my first time wine tasting and it was helpful to have some guidance as I sniffed, sipped, swished and swallowed each new flavor. The next day we set off in our little car to explore a few near by wineries. The first stop was Bodegas Etchart, a beautiful estate surrounded by vineyards in the heart of the Calchaquies Valley. During the 30 min tour we viewed barrels upon barrels of wine and were given a brief history lesson of the estate and grapes they use. After the tour we were lead to the main attraction: wine tasting! Groups of 8 surrounded giant wooden barrels that were used as tables and we were led through the tasting of 5 different wines the estate produced. After emerging from the cool, dark insides of Bodegas Etchart, we set off to Finca Las Nubes (Bodega Jose L. Mounier), a beautiful ranch style winery set back right up against the high sandstone cliffs of the valley. We sampled a bottle of their Rose of Malbec while enjoying a fresh plate of charcuterie, as we sat on a patio over looking the vineyard. This is the life I could definitely get used to! The next day we bid a sad farewell to the vineyards and wineries as we set off back up Route 68 to Salta. As always, it would have been nice to have a bit more time exploring the area but adventure was calling us to Iguazu Falls at the Argentinian/Brazilian boarder. And who am I to ignore the call of adventure?